On 16 August 1914, at the opening of World War 1, the French Navy advanced up the Adriatic in force, hoping to provoke a pitched battle with the Austro-Hungarian Navy. What resulted was the one-sided Battle of Antivari. The idea of the single great and decisive encounter between full fleets had dominated much naval thinking since the British victory at Trafalgar in 1805, from which French (and Spanish) naval power never recovered during the remaining decade of the Napoleonic Wars. Prior to 1914 it was widely assumed that fleets of battleships, supported by scouting cruisers, and by flotillas of destroyers and torpedo boats, would clash in climatic battles that might well decide the outcome of an entire war. 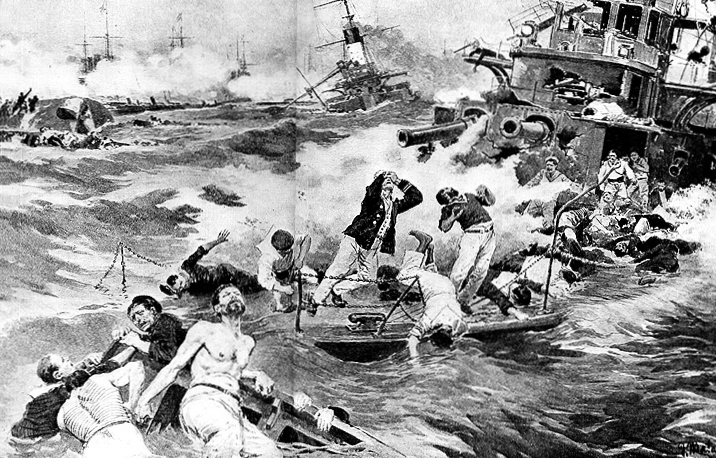 This had indeed happened three times since Trafalgar – Japanese victories over China at the Yalu in 1895, and, massively, over the Russians in Tsu-Shima in 1905, and the American triumphs over Spanish forces at Manila Bay and Santiago in 1898, had been the decisive factors in bringing the vanquished to the negotiating table. In the years immediately prior to the opening of World War 1 in 1914, enormous investments had been made by all the Great Powers in expansion of naval capability. 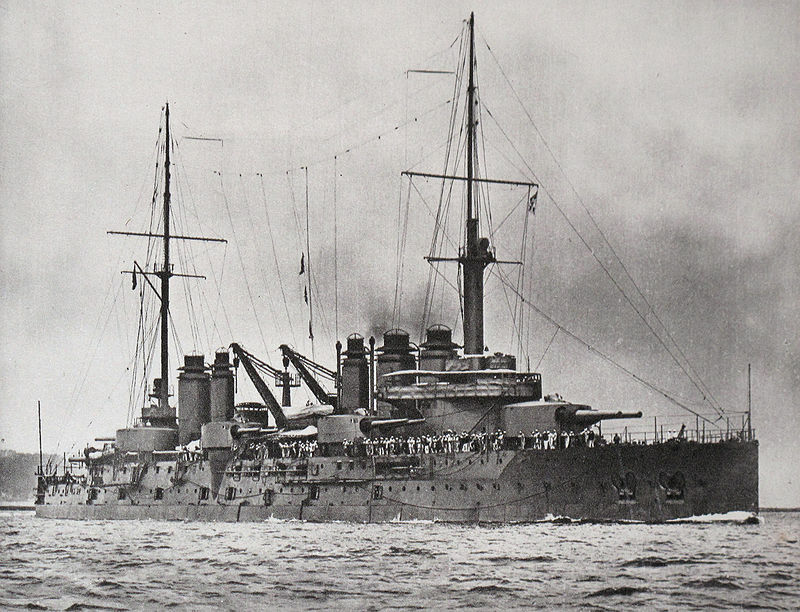 This was characterised by urgency in building of heavily armed and armoured “dreadnoughts,” seen as essential since Britain’s launching of revolutionary HMS Dreadnought in 1905 had rendered all existing battleships – including Britain’s – obsolescent. What had not been sufficiently appreciated however was the fact that the very magnitude of this fighting capability, and the massive investment, it represented, made risking its loss potentially fatal. 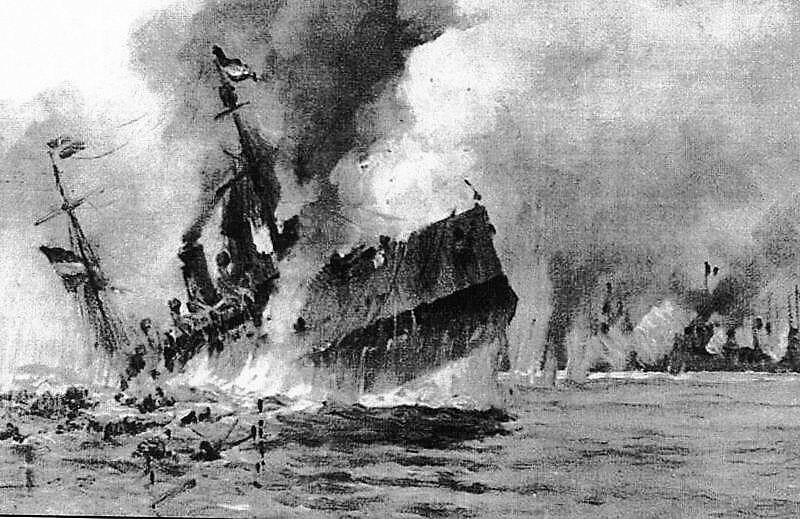 Churchill summed up the situation with his description of Admiral Jellicoe, commander of the Royal Navy’s Grand Fleet as “The only man who could lose the entire war in a single afternoon.” World War 1’s only full-fleet confrontation, that between the British and German navies at the Battle of Jutland in 1916, was to be characterised by caution on both sides, though it can be argued that the Germans “blinked first”. 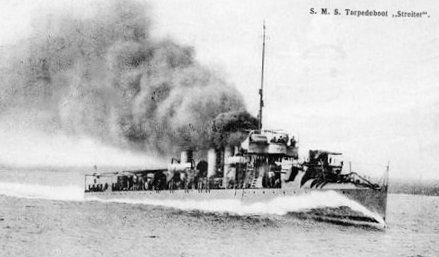 Pre-war thinking had emphasised the role of gunnery and had taken insufficient note of the extent to which minefields, and increasingly submarines, would change the nature of sea warfare. In practice the presence of a “Fleet in Being”, kept in protected anchorages but representing a threat which could be unleashed at any time, was to prove critical in obliging an enemy to deploy its forces so as to be ready to deal with it. The initiative rested with the possessor of the fleet in being. The informal Anglo-French accords reached in the decade before the war were based on an assumption of confrontation with the Triple Entente of Germany, Austro-Hungary and Italy. 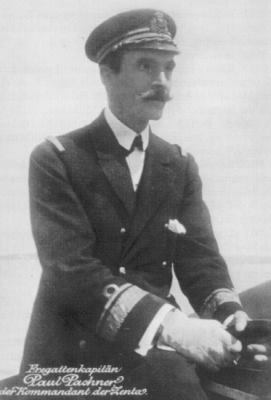 It was agreed that British naval power was to be primarily concentrated in the North Sea to confront Germany, while French forces were to face the Italian and Austro-Hungarian navies in the Mediterranean. In the event Italy was to stay out of the war initially, and when she finally entered, in 1915, was to do so, for the most cynical of reasons, on the side of Britain and France. In August 1914 the main French concern was protection of troop convoys between French possessions in North Africa and Metropolitan France (and indeed throughout the war France was to depend heavily on colonial troops). With Turkey not yet formally involved in the war the main threat to such convoys would come from the Austro-Hungarian fleet, a powerful force with four modern dreadnoughts, ten pre-dreadnoughts and three old coast-defence ships, with significant cruiser, destroyer, torpedo boats and submarine forcess to support them. It was a well-balanced force but its weakness was that it was based in the Adriatic, a long-narrow sea that could only be exited or entered by the 48-mile wide Strait of Otranto. 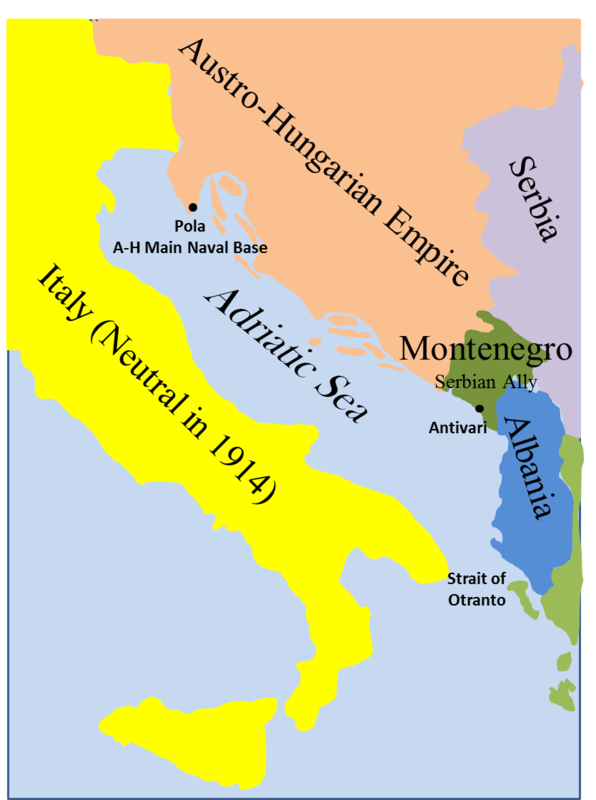 The main Austro-Hungarian naval base was at Pola, at the Adriatic’s northern end. 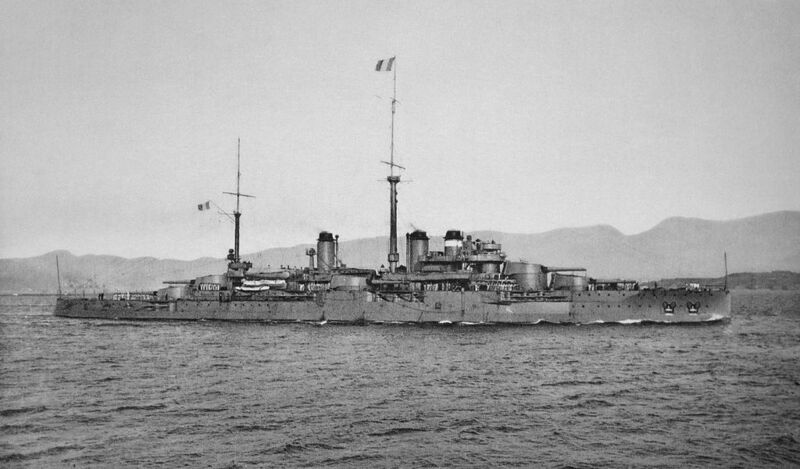 For the larger French navy there were two options – to enter the Adriatic in force and hope that the Austro-Hungarian fleet would accept the challenge and face annihilation or to close off the Adriatic by blockading the Otranto Straits. In the first month of the war the first option looked like an attractive one, possibly the more so since France had no naval victory to its name since its humiliation at Trafalgar. Hostilities had been in progress between Austro-Hungarian and Serbian forces since late July – the conflict that triggered the larger European War. Serbia’s small neighbour stood by her and it was only through this country that military supplies could reach the Serbians from her French and British allies. 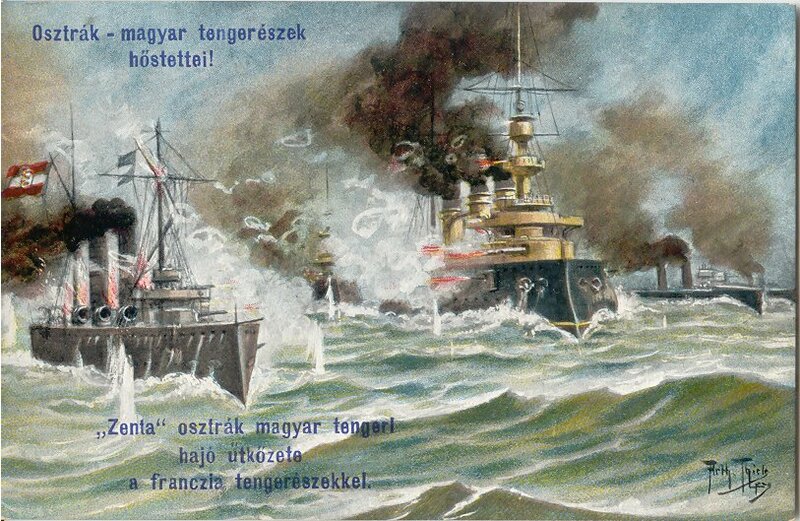 The harbour of Antivari (today know as Bar) was the main point of import and the Austro-Hungarians immediately took steps to blockade it with the small protected cruisers Szigetvár and Zenta, supported by three Hussar-class destroyers and four torpedo boats. The old coast-defence ship Monarch was available for support. Had this Anglo-French fleet force encountered an Austro-Hungarian squadron of similar size the result could well have been a battle of Tsu-Shima dimensions. On sighting the oncoming enemy force the tiny blockading force at Antivari retreated and, refusing to be drawn, the Austro-Hungarians made no effort to send heavier forces to support it. 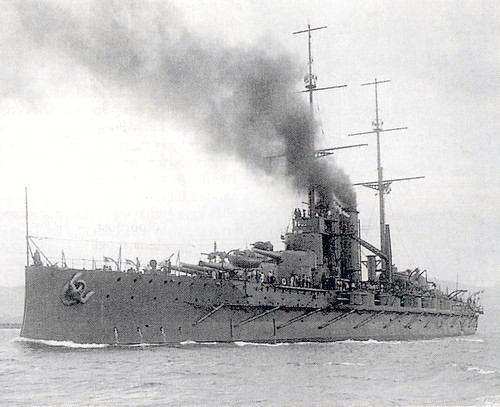 The Allied fleet cut off only the cruiser Zenta and the destroyer Ulan, the former, an obsolete unit dating from 1897 hampered by worn-out engines. The Zenta was signalled to surrender but her commander, Captain Paul Pachner (1871-1937) – shown on the left – decided to fight it out despite the overwhelming odds. The contest was unequal in the extreme. The Zenta, with her main armament of eight 4.7-in guns was taken under fire the Courbet, the French lead-ship, which carried twelve 12-in. The outcome was inevitable, the Zenta being finished in ten minutes though in the process buying sufficient time for the Ulan to make its escape. Given the large numbers of destroyers in the Allied force it is hard to understand why any of the Austro-Hungarian ships were allowed to get away. Of the Zenta’s 308 man crew only 129 survived. 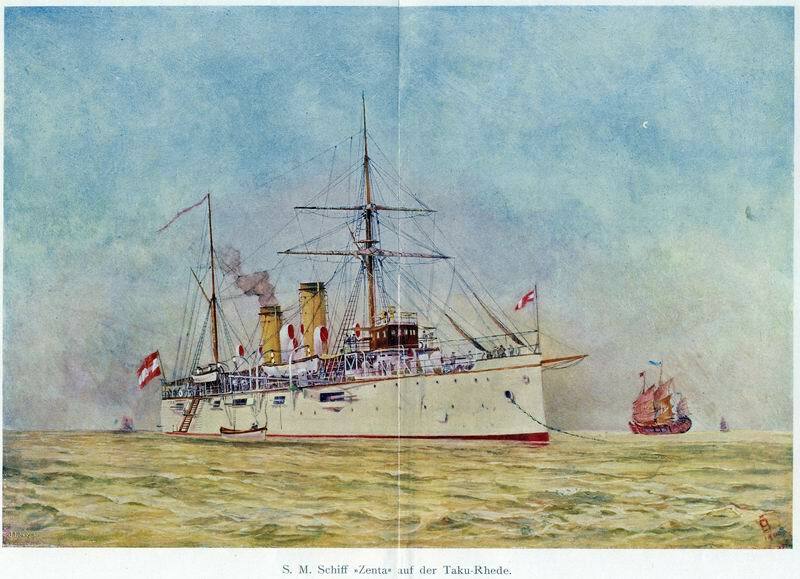 Pachner was heroic in defeat – having already left the ship he noticed that there were still some men left on the quarterdeck. He swam back, boarded, and ensured that all got away before he himself did – the last man off. The other survivors were rescued by local fishermen and taken thereafter into Montenegrin captivity. They were to be liberated by Austro-Hungarian troops in 1916. The Allied force withdrew after the battle and elements of it began the long-blockade of the Strait of Otranto which was to endure for the remainder of the war. 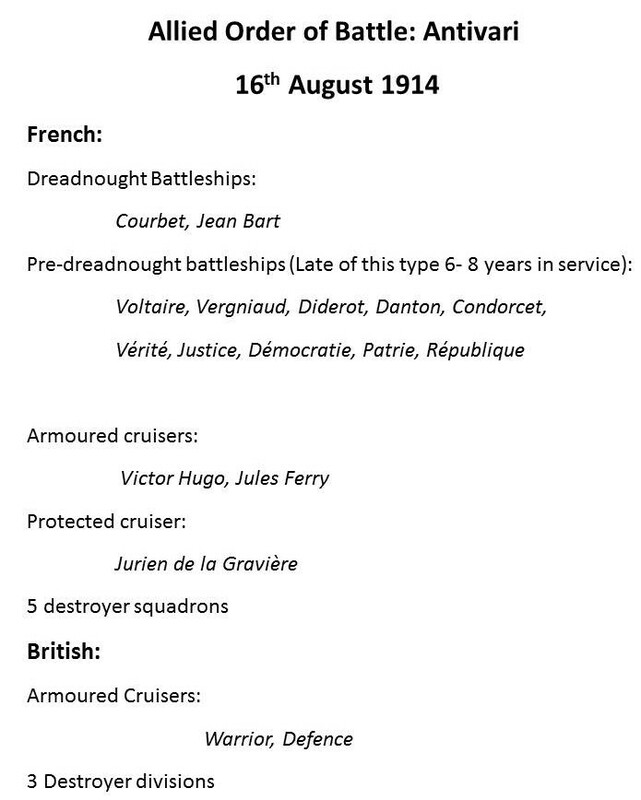 Three of the larger Allied ships involved were themselves fated not to survive the war. The Danton was torpedoed by a submarine in 1917 while the Warrior and Defence were to be lost at Jutland in 1916. The strangest end of all was reserved for the Courbet – inconceivable as it was in 1914, she was to be sunk as part of the Mulberry Harbour off the Normandy beaches in 1944. Largely forgotten today, the hopeless stand by the Zenta deserves to be remembered in the same way as those of the Rawalpindi and the Jervis Bay in World War 2. In all these cases flight was and option – and it was always refused. The Zenta’s crew died in the service of a moribund empire and a senile emperor. They were better men that those they served so heroically.